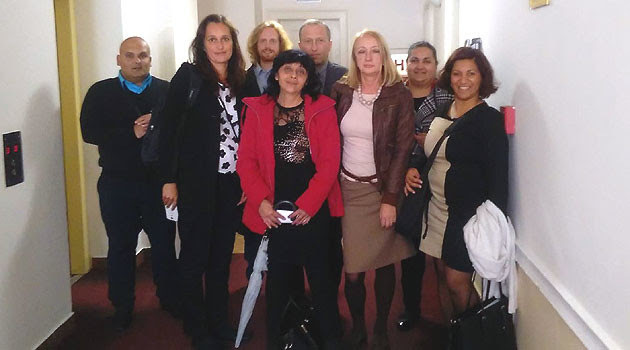 Czech Deputy Education Minister Václav Pícl met with representatives of a National Working Group that consists of 11 Romani non-profit organizations from all over the Czech Republic on 3 October in his office at the ministry. “The aim of the meeting is to establish a constructive collaboration between established Romani nonprofit organizations and the Education Ministry. The coalition works with as many as 8 000 Romani people around the country and can be a bridge between the Romani community and the state administration,” said Jelena Silajdži, director of ERGO member Slovo 21. During the hour-long discussion the specific aims and the fulfilment of the Czech Government’s Romani Integration Strategy were touched upon, as was the insufficient representation of Romani people in advisory positions within the executive branch, the legislature and the state administration, as well as the planned changes to pre-school education next year and scholarship programs for Romani students. The ministry representative was invited to visit the IQ Roma Service organization in Brno to see examples of good practice in the area of preschool education and activation of Romani parents. The NGOs will continue their discussions with the Education Ministry at their next meeting in December. Representatives of IQ Roma Service, Jekhetane, OSF Praha, ROMEA and Slovo 21 attended the meeting. Slovo 21, ERGO Network’s member from Czech Republic, is coordinating the work of the coalition through the project “Roma Included”, which is part of ERGO’s Annual Work Program. The project is organized with the financial support of the European Commission’s EaSI program.